In a saucepan, heat the chicken mole on low. In another saucepan, heat enchilada sauce mixed with salsa. Using a third pan, add a little oil (likely canola) and heat corn tortillas until warm. Be careful, they will rip easily. Holding tortillas in the palm of your hand, add a generous spoonful of mole, a handful of chopped yellow onion, and a small amount of cheese on top of that, then roll up the tortilla, place gently in an oiled baking dish. Repeat until dish is full. 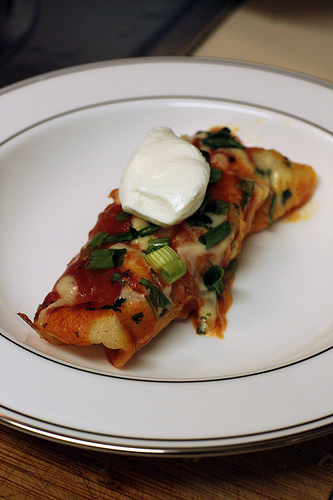 Using a ladle, distribute enchilada/salsa sauce over tortillas, then sprinkle remaining cheese on top. Garnish with green onions and bake at 350 for 20 minutes.